Could Fantastic Beasts: The Crimes of Grindelwald lose money at the box-office? I read my first Sigma Force novel, Map of Bones, circa 2006. Those were different times— the world was yet to properly hit the financial crisis, Justin Bieber was unheard of (good days) and a little book called The Da Vinci Code was making waves when the film adaptation starring Tom Hanks was released. This latter development led to a sudden explosion of Da Vinci Code-imitators, all hoping to capitalise on the mystery-historical-detective novel’s success. I considered Map of Bones to be among that slew, even if it was a more military-esque and fun romp. Today, I wish to eat my words for thinking like that. 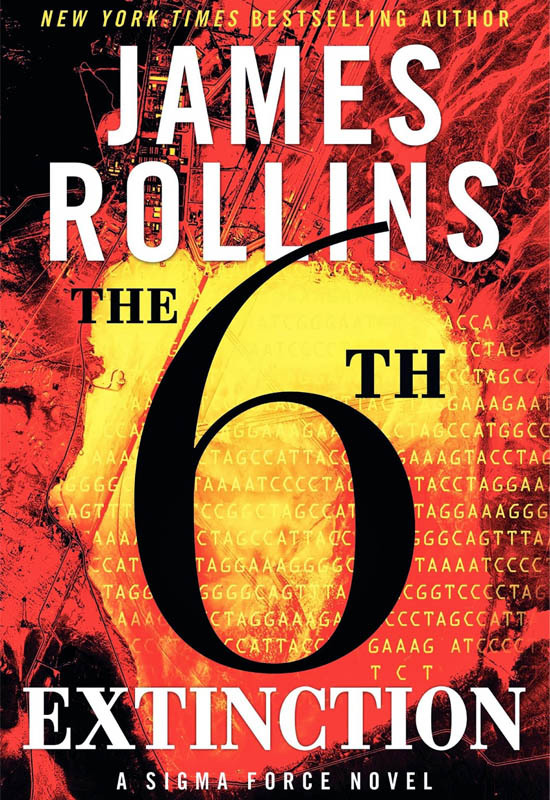 The 6th Extinction is the tenth instalment in James Rollins’ Sigma Force series. Sigma Force is a fictitious division of the U.S. DARPA program, the operatives recruited specifically for their military skills and scientific knowledge. In other words, they are gun-toting scientists. You are not necessarily required to read the past books to enjoy this one but it would certainly be advisable before embarking on this. The 6th Extinction opens with Charles Darwin and the crew of the Beagle anchored outside Antarctica. Their eager hopes of conquering undiscovered land have ended disastrously, having encountered a deadly terror instead. What exactly is left unspecified and never makes it to historical record. In the present day, a California State Park Ranger, Jenna Beck, sets out to investigate an intercepted distress call from a military research site. Within minutes of arriving, the site is destroyed in a cataclysmic explosion, the cloud of smoke also containing a deadly toxin killing every living thing on immediate contact. Sigma Force sends a small team to investigate, led by Dr Lisa Cummings, the fiancée of the division’s director, Painter Crowe. What they discover plunges them headfirst into a horrifying situation when they realise they are dealing with a seemingly-impervious virus constructed out of what appears to be alien genetic coding and impossible to contain. As the virus spreads outwards, Sigma Force finds itself on an impossible deadline to not only retrieve the cure but stop the government from carrying out its last resort: detonating a nuclear bomb as a deterrent. The adventure is split multiple ways: Commander Gray Pierce and his team, Joe Kowalski and young Jason Carter, travel to Antarctica to locate a man who might possess the key to their problems; Painter, Jenna, Marine Gunnery Sergeant Drake and two other Marines head to Brazil, tracing a cell phone call in the hopes it will lead to answers and the man responsible for the research facility sabotage; and Lisa is frantic in her search for a cure as the life of her brother and Jenna’s dog hangs in the balance. And in a hidden base atop a tepui in Roraima, the mastermind at the centre of this maelstrom quietly prepares to make his final ploy: the extinction of mankind. With more than ten years of writing experience behind him, James Rollins effortlessly moves through the science-heavy constantly-twisting plot, weaving a thrilling, briskly-paced and highly charged narrative that refuses to let up until it’s over. He might not be Hemingway or Dickens but his prose leaps off the page with a crackling burning intensity not normally expected from a book in this genre, conjuring an intensity and tension that is relentless. It is a reminder of how good a thriller can be if done well. The 6th Extinction is everything you’d expect from a James Rollins’ novel— which means you end up with the unexpected. Throughout Sigma’s years, the team has encountered increasingly bizarre doomsday scenarios. All of them share ties with historical figures. Charles Darwin, Marco Polo, the Magi and the Templars— to name a few— have all played significant parts in the Sigma résumé. Last year, The Eye of God dealt with Genghis Khan and dark energy— now there’s a sentence I never imagined I’d say. The 6th Extinction outdoes them all: it features Gray diving into a pre-continental world under Antarctica that is teeming with dangerous alien wildlife, almost lifted straight out of Arthur Conan Doyle’s The Lost World. The 6th Extinction is new territory: it’s Sigma-Force-meets-Jurassic-Park-meets-The-Lost-World-meets-Prometheus. I find that the Sigma Force series manages to stand out from the usual military-thriller fare clogging bookshelves these days. Somewhere around the fourth book, The Judas Strain, a great emphasis was placed on character arcs and evolution over the years. Gray Pierce, for instance, is now in a relationship with the same woman who tried to assassinate him in the opening of Map of Bones. Director Painter Crowe is getting married. Joe Kowalski… well, he still likes to blow things up. The Sigma Force series finds itself at what might be the start of a new saga. Most of the first eight books were primarily focused on the group’s battle with an enemy faction known as The Guild. Each book had Sigma drawing closer towards the upper echelons of the organisation and finally in Bloodline, the leader’s identity was exposed. When The 6th Extinction opens, The Guild has been destroyed albeit at many personal costs and lives. With each instalment, it is similar to catching up annually with old friends and new for a deadly road trip. Indeed. And I, for one, eagerly look forward to it. Next Next post: What’s So Great About Spaced, Anyway?